Home Scandal and Gossip Why? North Carolina woman tied puppy to truck- drove until it died. Why? North Carolina woman tied puppy to truck- drove until it died. 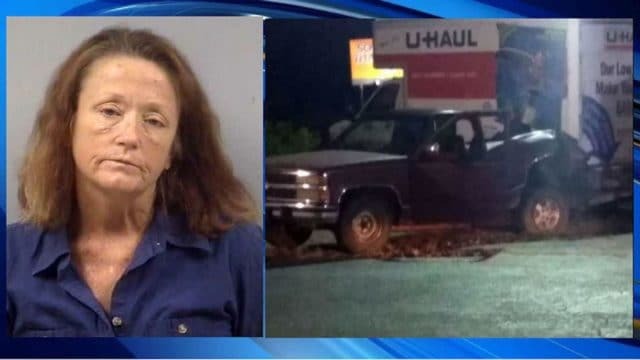 What led to Gloria Mitchell a Garner, North Carolina woman tying a puppy dog to her pick up truck and driving until the animal was dead? Also taking her rightful place on tabloid mastheads is North Carolina woman Gloria Mitchell, 45, following allegations she tied a puppy to her pickup truck and then drove around it until the dog died. WBTV reported Mitchell being arrested on July 5 at the Knights Inn motel in Selma following onlookers calling police to report that a puppy dog had been tied to the front of a woman’s vehicle and she refused to stop driving. In a statement, Selma Police Department said Mitchell drove the truck around until the dog died. According to an incident report, there was ‘a lot of screaming in the background’ when one witness called 911. Officers said Mitchell was intoxicated and ‘had a very strong odor of alcohol coming from her person’. The smell of booze could be smelt from ‘several feet away’, noted one police officer. Mitchell was booked with having a blood alcohol level of .347. The legal limit in the state of North Carolina is 0.04. Upon the dog having died, Mitchell crashed her truck into a U-Haul van. A photo released by authorities shows the back of her maroon pickup truck smashed into the side of the moving truck. ‘Whether it’s a puppy, a bird, a child – it’s a life,’ witness Vikki Latner told WBTV. Mitchell was observed being ‘hostile and aggressive’ towards officers and EMS workers when they arrived to the scene. Gloria Mitchell of Garner was taken to the Johnson County Jail on a charge of animal cruelty and is scheduled to appear in court later this month. Not immediately clear is what motivated the woman to take the vulnerable animal and tie it to her pickup truck and drive in a manner in which death was imminent….